Ben Bullington wasn't just any small-town Montana doctor. He was also a revered songwriter who counted Rodney Crowell, Will Kimbrough, and Darrell Scott among his fans and friends. But despite his fanbase, Bullington's first-ever Nashville performance happened in December of 2012 at the Station Inn, a month after he was diagnosed with pancreatic cancer. The following November, Bullington died, though his songs lived on. 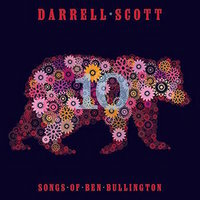 To give them even more life, Scott put his own fine touch on them on the upcoming '10 - Songs of Ben Bullington' album. It's a touching affair, through and through, with Scott's fondness for the writer and the written shining bright. Kelly McCartney: When Ben got his diagnosis, he quit his work as a doctor and devoted his remaining time to making music. That seems like a pretty solid endorsement for platitudes like "do what you love" and "live like you're dying." What lessons did you learn from watching how he moved through that time? Darrell Scott: I had great respect for his choices -- both NOT touring before his last year AND starting to tour in his last year. I understood both and admired him for his decisions. What is it about his songs that touched you enough to record an album's worth of them? What do you think you bring to these songs that no one else could have? I think I brought a sincere simplicity. (I think others could do the same.) Plus, these songs are folk songs and I love folk songs -- so did Ben. Does being a songwriter yourself make it easier or harder to step into someone else's stories? It makes it easier, I suppose. I know what the song is trying to do. You took a decidedly simple approach to the production of '10.' Why go that way rather than another? I thought the songs had a simplicity (while talking about complex things) which I thought was beautiful. I wanted to portray them honestly and without any recording trickery -- what you hear is what you get. Ben was that way, too. '10 - Songs of Ben Bullington' will be released on May 19 via Full Light Records and is available HERE.